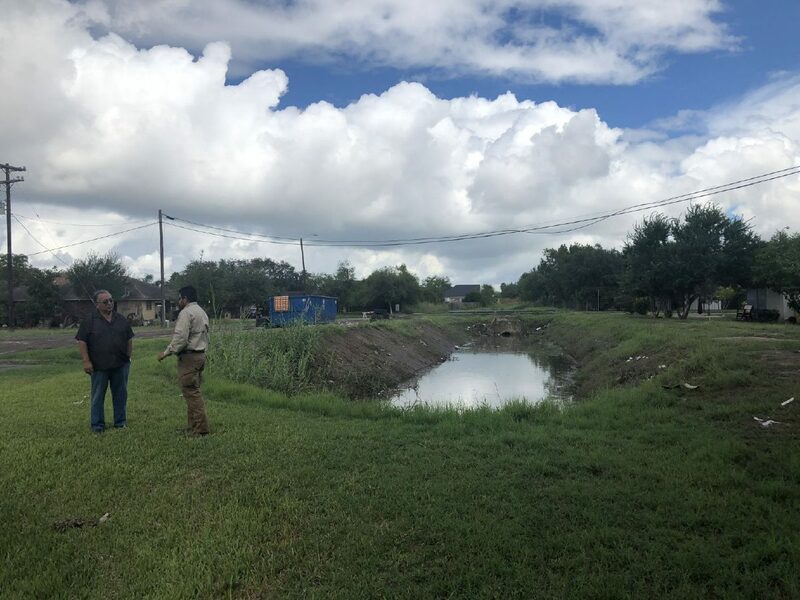 City of Weslaco employee Efrain Tafolla talks to resident Domingo Jasso on Wednesday near a drainage ditch in the city. Hidalgo County, Weslaco and Mission emergency command centers began operations Wednesday as a tropical depression heads toward Texas. Hidalgo County, Weslaco and Mission emergency command centers began operations Wednesday as a tropical depression heads toward Texas and Tropical Storm Isaac moves westward across the Caribbean Sea toward the Gulf of Mexico. Hidalgo and Starr counties and cities, drenched this week by rain showers, are bracing for more rain from the tropical depression, nearly three months after thunderstorms flooded portions of Hidalgo County. 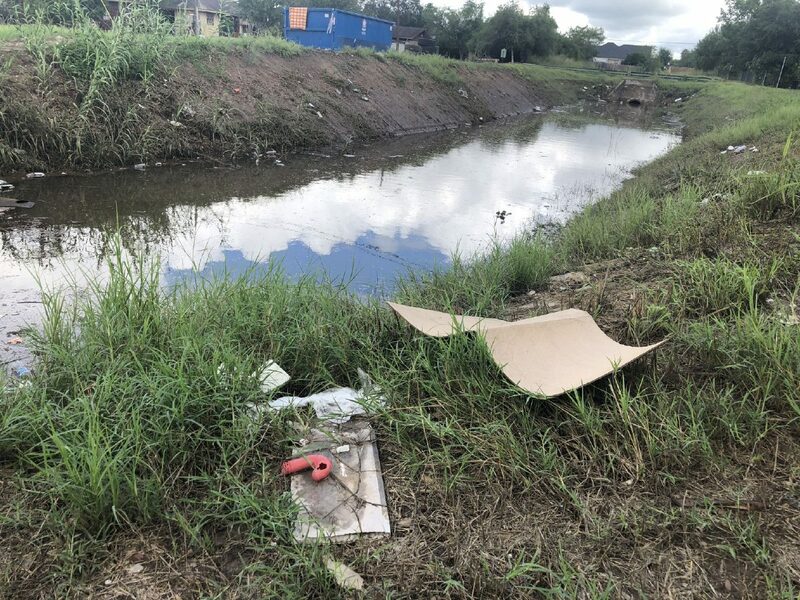 A photo of a drainage ditch near Paisano Lane is seen Wednesday in Weslaco. Hidalgo County, Weslaco and Mission emergency command centers began operations Wednesday as a tropical depression heads toward Texas. Abbott bumped up the state’s disaster readiness Wednesday in preparation for an emergency response. The Texas Department of Emergency Management, TDEM — the state agency overseeing disaster response — began coordinating resources, such as pumps and high-water rescue vehicles, to be dispatched in the event a tropical depression, tropical storm or hurricane makes landfall here. “Texans are urged to continue preparing for the tropical disturbance headed toward the Texas coast and expected to make landfall at the end of the week,” Abbott said in a news release. Representatives from the Texas Department of Public Safety and TDEM joined Weslaco department heads, commissioners and Mayor David Suarez Wednesday morning for a briefing on emergency response, a meeting held to coordinate and direct resources toward responding to inclement weather. The National Weather Center estimates about a 70 percent chance that the disturbance will develop into a tropical depression Thursday and is predicted to dump heavy rainfall on Texas. “But the good point about it is that it’s got too short of a distance to (form) into a tropical storm. They’re saying it’s going to come in as a tropical depression — just bringing a lot of rain to us,” said Hidalgo County Emergency Management Coordinator Rick Saldaña. Weather experts anticipate 4-to-10 inches of rain beginning Thursday, he said. Weslaco City Manager Mike Perez instructed city staff to pause water disconnections, allowing residents to prepare for the storm instead of focusing on paying their water bills. Following the meeting, public works crews worked on the flow of water lingering in a ditch from heavy rainfall Tuesday night near Paisano Lane, located east of Home Depot off West I-2. Crews also conducted inlet inspections and maintenance of ditches. In neighboring Mercedes, the city purchased an evacuation vehicle after flooding in June and began preparations this week, including requesting additional water pumps. “We are already ready. We have National Guard on standby and the Texas Department of Emergency Management,” said Mercedes Mayor Henry Hinojosa. Meanwhile, Saldaña’s office is partnering with the county drainage district and precinct offices to position more than 20 pumps in areas inundated with rainfall. After three days of unrelated showers, which began Saturday in Hidalgo County netting up to 10 inches in portions of the county, officials remain aware of the fact that the ground is saturated, increasing the possibility of flooding if the tropical depression heads this way. Edinburg requested four additional water-removal pumps for the city, which conducted evacuations Tuesday. Mission and Donna temporarily asked residents to stay off roads Monday and Tuesday, respectively, due to major flooding in portions of the cities. About 70 percent of the ground in Mission remains saturated with water, according to Mayor Armando Ocaña. Starr County officials are coordinating with local municipalities to prepare for more rain, which prompted evacuations on Monday. In Roma, the city’s water plant recorded over 11 inches of rain between Sunday’s storm and Monday’s storm, according to Assistant City Manager Freddy Guerra. The retention pond, located within the El Bosque subdivision, started overflowing into the streets but didn’t reach homes. The city has three other retention ponds to drain the affected subdivisions before rain starts up again. Other areas affected areas in Roma included Hillside Terrace, Las Flores, Mi Ranchito and the Robinson subdivision, where flooded streets left the neighborhood inaccessible to its residents. Water went into homes in the Las Flores and Mi Ranchito subdivisions. Residents are also asked to contribute to disaster preparation by keeping debris off roadways and drainage systems. > Jaycee Park — Los Ebanos Road and Barnes St.
> Ray Landry Fireman’s Park — 906 Canal Ave.
Distribution will be from 9 a.m. to 9 p.m. every day through Friday, Sept. 14. Shovels are provided but residents are asked to bring their own to expedite the process. Bags are limited to six per household and ten per commercial building. An ID showing proof of Mission residency is required. > City Hall at 255 S. Kansas Ave.
> Harlon Block Park at 1020 W. 18th St.
>North Water Plant at 2500 N. Texas Blvd. >Donna Public Works at 1301 Silver Ave. Residents are asked to bring shovels to the self-fill stations. Mile 11 N and Mile 1 ½ W.
Distribution will be from 9 a.m. to 6 p.m. on Thursday. Sand bags and shovels will be provided. Bags are limited to five per household and ten per commercial building. A utility bill to show proof of residency is required.